My French children take bread for granted (well, they are French afterall!!) 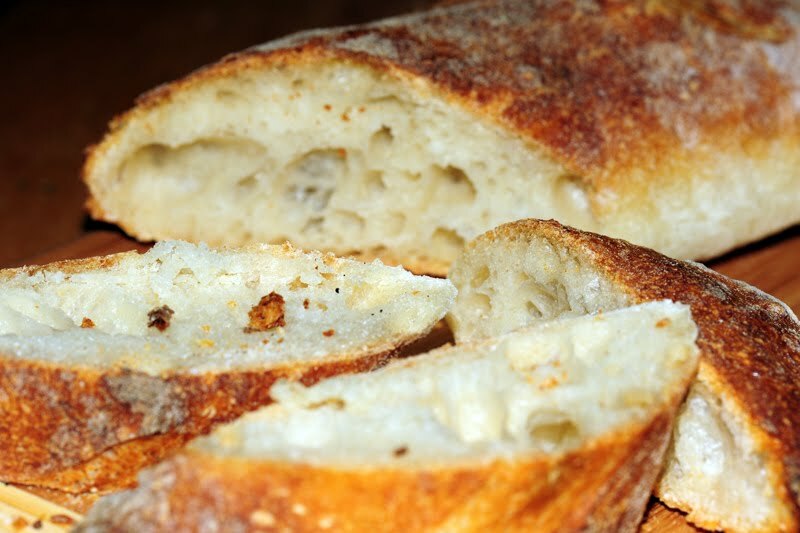 The fact that I started making my own baguettes and boules with sourdough starter (aka levain in French) did not strike them as crazy strange. We have to have bread, so either we purchase it (our two favorite places in Philadelphia are Fork Etc. and Metropolitan Bakery) or we make it. The choice is easy, n'est-ce-pas? They actually think that making baguettes or boules is fun, especially when Bubulle (nickname of our sourdough starter) makes too many bubbles and overflows its container! They know that I use Bubulle to make bread. It's part of their daily diet. Nothing to write home about! Mini buckwheat galettes are one of our favorite recipes with sourdough starter beyond bread. My children do find it great that we can make something different with Bubulle. They love this recipe, which reminds them of pancakes and savory galettes. 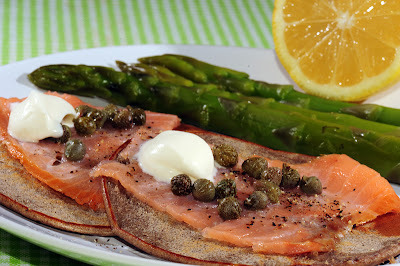 Mini galettes topped with smoked salmon and cappers. Un vrai régal. I could feed them the mini galettes everyday... and I know that it's going to be a smooth dinner if I offer them! No reason why not to make Bubulle double or triple in size when we can have mini-galettes in no time (and no effort!)! Bon Appétit! Combine the sourdough starter with buttermilk and flour. Add milk and stir until you get a smooth dough (like pancake). Set to rest for one hour. Add pinch of salt. Over medium heat, spread a laddle-full of dough onto a pan. Cook for about 2-3 minutes on one side. When you feel that you can flip it over without shredding the mini galette, flip it over and let cook for another minute. I don't like them cold... but my children don't mind so I put some in their lunchbox the next day. You could put something else on top: cheese, mushrooms, etc. Believe it or not, it has been a year since I started this blog. Oui, un an déjà! I hope that you have been enjoying it as much as I (and my family) have been. My husband, despite all the teasing in the blog, still thinks that it's the best thing that has happened in our family kitchen over the last 12 months. He has enjoyed all the new pâtisserie recipes and most new savory dishes I have made. The only drawback is that I don't really cook the same recipe twice anymore, which means that he had not had a boeuf bourguignon in about 11 months! 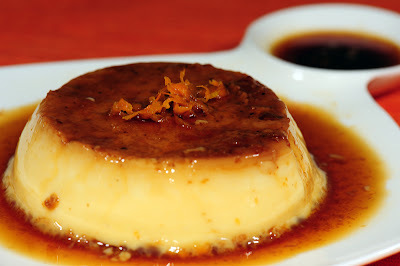 But hey, how many nice sweet desserts like this Crème renversée au caramel à l'orange? My children are more interested in food than they previously were. I have witnessed them try new things, even if "ça pique" (as in spicy food) or being willing to taste new food at restaurants. They always want to cook with me, trying to make up their own recipes, and always asking what I am making if they can smell something coming out of the kitchen... and my little one (like his father) always looks towards the kitchen counter where I put desserts to cool, asking if there is "un petit dessert"? If I could only give you one advice (or two) for the year to come: cook from scratch and get your children involved as much as possible. It might be a mess challenge at first but be sure that it's energy well invested in the long-term. The more you cook with them, the more likely they are going to eat what they cook; the more likely they are going to cook for themselves later on in life because they will have acquire some skills to prepare food. And yes, cut on the snacks unless they are fresh fruits/nuts/vegetables! I mean it! Bon Appétit! - 2 vanilla beans, cut lengthwise. Pre-heat oven to 180 C (360F) and put the ramequins in the oven to heat. In a pot, bring the milk, sugar, vanilla beans, and zest of one orange to a boil. You want to scrap the vanilla beans into the pot to increase the flavor. Remove from heat and let infuse for at least 20 minutes. Make the caramel while the milk cools down. Cook in a double-boiler in the oven for about 40 minutes. Cool at room temperature and then in the fridge for at least 3 hours. To unmold, put the bottom of the ramequins in hot water for a few minutes before flipping them over and serve. In pan, mix juice and zest of one orange with sugar and 2 TB of water. Bring to a boil and let simmer until the liquid starts to get a caramel color. Don't overcook or it will burn. Pour the Caramel in the ramequins, making sure to coat the sides as well. This recipe is also really good with clementines instead of oranges. Or there is this subtle hint along the line of... "could-we-please-have-something-sweet-for-a-change?" (read: I have been out of the baking territory for too long but he does not intend to bake himself. ) It's subtle and it's one of the annoying wonderful things about marriage: being able to get your spouse's language subtleties! Depending on my mood willingness to really understand the hint, I act upon it. Or not. And if I do, well, then, I am using my "power of the baker" and make what I feel like making, not necessarily what my husband would have liked me to bake. The other day, donc, my husband went grocery shopping. And he brought back Meyer lemons. He fell in love with Meyer lemons a few years ago and has been purchasing some everytime he sees them (hence the somewhat expected when in season; they make great Lemonade!) Well, the other day, he confessed, that he was really looking for Key limes because he wanted to have a Key Lime Pie (why? don't ask!). Because he failed to find some, his choice fell back on Meyer Lemons. Key Lime Pie, he would have baked himself. 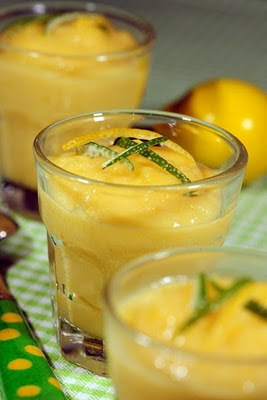 Meyer Lemons dessert, it was up to me! (why? don't ask!) I had few ideas but decided to make lemon curd. This recipe by Tartelette is nothing like the store-bought jar of lemon curd you could purchase. It's more like a crème au citron (lemon custard) and I like it even better for that (but maybe the store-bought-jars are nothing like real lemon curd!!) To the point that I could just spoon it out and eat it comme ca. Very unlike me! My kids are big fans of lemons too (why? don't ask! ), so lemon curd is something they also enjoy (not as much as the petits pots de crème though). My husband was expecting something else with the Meyer lemons (maybe a Meyer Lemons Pie??) but he overcame his disappointment and ate the lemon curd as well. He did say that "it would be perfect with a cake au citron" (Read: one of my "specialties"!) Bon Appétit! In a saucepan over medium heat, combine the lemon juice, zest and sugar and bring to a simmer. Stir occasionally to make sure the sugar is dissolved. In the meantime, whisk the eggs in a medium bowl just until combined. Once the lemon mixture is hot, slowly pour it over the eggs to temper, continuously whisking to prevent the eggs from scrambling. Return the mixture to the pan set over medium low heat and cook until thick. Do not let it come to a full boil or it might separate. Remove from the heat, stir in the butter and whisk until it is fully melted. Cover the surface with plastic wrap to prevent a skin from forming and let cool to room temperature. It is indeed really good with a Cake au Citron or scones. Even though the eggs are fully cooked, I would not keep it for more than 2 days in the fridge. A few months ago, I was talking with a friend who lived in Ireland for a few years. He was on his way to Florida and made stop-over in Philadelphia to visit us. We were talking about where he'd like to live after Ireland. Being European, he had a lot of options (Europeans can work in most European countries without a work visa) but one thing he said struck with me. He said that "he'd rather live in a country where fruits and vegetables grow mature on trees/plants with natural sun before they reach their markets" He was tired of eating beautifully-shaped-green-house-grown-and-tasteless tomatoes from Holland while in Ireland! That's when I realized that I would have a hard time living in a country where cold weather or natural location make it difficult to eat fresh fruits and vegetables all year long! In other words, I'd have a hard time to live in Sweden but would not mind living in Italy!! Pineapple (or ananas en français) is a fruit I enjoy only if cooked. If I eat too much of it fresh, I get minor aphtous ulcers which are definitively not pleasant. So I don't resist the temptation and eat it fresh just cook it! I cook it with brown sugar as dessert or, like in this recipe, I cook it as a vegetable. I personally love it and so do my children. It's always a new and fun experience when I serve them "un fruit comme un légume": apples (like apples in the Rôti de Porc aux Pruneaux et aux Pommes), mango, figues (why are they sooo expensive?? ), quinces, coconut, grape... we pretty much cook all of them as vegetables in sucré-salé dishes. It's delicious, it's original (unless you eat a lot of Asian food already) and a great add-on to make your easy-to-cook dinner look fancier and healthier! It's also a great way to feed young children fruits before they can digest them raw! Bon Appétit! In s pan, over medium heat, saute the onion and chicken in olive oil. 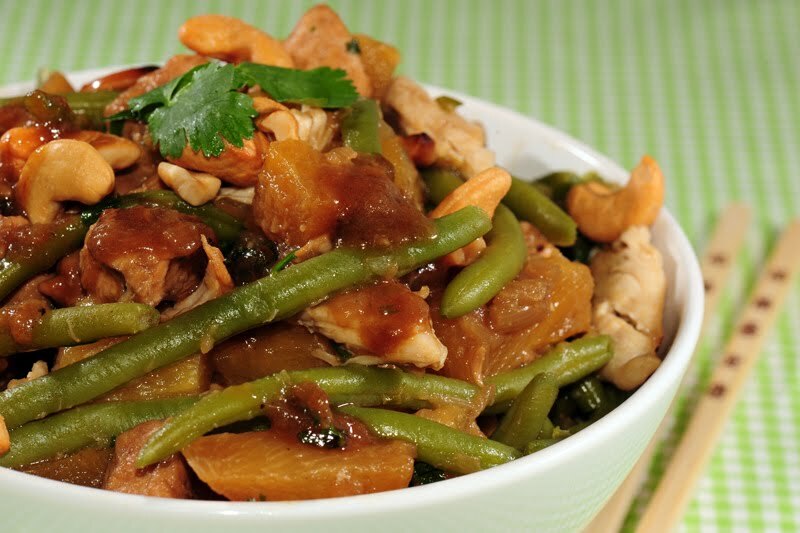 Once the chicken is cooked, add the pineapple dices, the green beans and cashew nuts and saute for another 5 minutes. Add salt and pepper, and Cayenne Pepper to taste. You could serve it with Basmati Rice but with green beans and pineapple, I find that's enough for us. Bread is important to us. CRITICALLY important, I should say. We eat bread at every meal and one of our pleasures back in France was to be able to get excellent breads at really affordable prices. In the tiny village where we spent most of July, there is a very good boulangerie for the 400+ inhabitants!! (yeah, I know!!) French people don't realize how lucky they are to have such an offering of good breads until they travel overseas. And taste the difference! I never thought I would bake bread myself even though I think that everyone should be able to make bread. Then, as I already talked about in my last post on bread, I thought that among all the different breads, baguettes were to be off-limits to me. Until I read articles on home-made baguettes with sourdough starter and thought that I should give it a try. I have been making my own baguettes for a few months now using a sourdough starter we nicknamed "Bubulle". Bubulle can be quite active as long as we keep feeding it. My children love to watch Bubulle overflow the way-too-small glass jar it has to double/triple in size. Making bread is now part of our cooking experiences and my daughter makes sure that I never forget the salt (it happened a few times and unsalted bread is really not good!) The results? Ma foi, pas mal (who, in my family's own terms means quite good!!) It's not me who says it but my husband and my children or other French people who have tasted it at our place... or the friends I give some when the baguettes are just out-of-the-oven and taste best! Sure, making baguettes requires more planning and timing than the boules I otherwise make... but once you have done it a few times, you know your baguettes will be good enough for you to stop purchasing OK-bread at $$$$. I don't have my own recipe, I pretty much follow Clotilde's or Flo Makanai's (in French) and played with the recipes to reach something I like. I am always amazed that the only things I need are : flour, water, salt, and some sourdough starter! That's it! Incroyable! I don't have enough time these days to read more about sourdough starter breads to improve the quality of my baguettes (I'd love the baguettes to be lighter but maybe it's just the sourdough starter?) but it's on my "to-do" list for the coming weeks. Until then, I'll keep improvising a little bit just to see whether this or that have a positive impact! Bon Appetit! Add flour and mix again on lowest speed just to "moist" the flour. After one hour, add salt and knead for 7-10 minutes on lowest speed. The dough should be very smooth. Transfer into a lightly oiled bowl. Leave on the kitchen counter for 2- 3 hours. The dough will rise. Take the bowl out of the fridge and leave it on the kitchen counter for at least one hour. The objective is for the dough to get back to room temperature. Take the dough out of the bowl and dump it on a floured baking sheet/cloth/silpat. Cut the dough in 4 pieces. Roughly shape the pieces into logs. Take a cloth and add flour to it : take one log, shape it into a baguette (you want to make sure that they can fit into your oven!!). Place it on the cloth and make a "wave" with the cloth near the baguette so that the baguette keeps it shape. Take the other logs and repeat. At the end, you'll have four baguettes laying on the cloth with some cloth "wave" separating them. Put a baking stone on the middle rack of the oven. Put a cast-iron skillet (or any deep metal baking dish) on the lower rack of the oven. Pre-heat the oven to 500F (250 C). Just before putting the baguettes in the oven, slash them with a sharp knife. When the oven is hot, place the baguettes on the baking stone. With great caution (and long sleeves or cooking gloves) pour the boiling water in the skillet. Close the door immediately. It will create a steam bath for the baguettes. After 30min, check the color of the baguettes, they should be golden brown. Take them out of the oven with great caution and put them on a cooling rack. Cool them completely before eating them. I generally leave the baguettes an extra 10 minutes in my oven because I like them really crusty. This recipe might not be the most professional one because I am just starting to make baguettes... but it has worked for me. I like the way it works out for my timing. 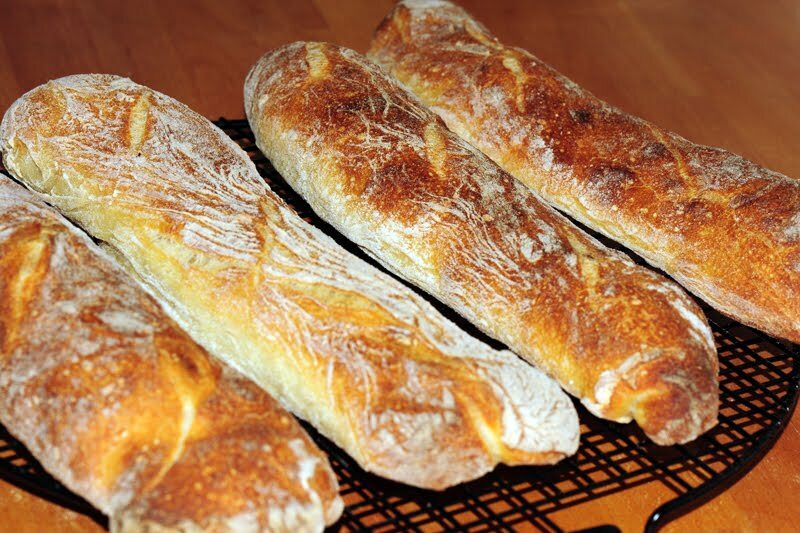 I can start in one afternoon and make the baguette anytime really the next day. If you want to see a professional version, go on to this video. As I already wrote, we eat yogurt everyday in our family, twice a day sometimes. Les yaourts (and dairy-based desserts) are a big part of the French diet. Whenever I go back to France, I love going to the dairy section of any supermarkets. I love looking at the new offerings, the new packaging and generally go back home with more yogurts that I can have! It's just heaven to me! I am lucky that we can find good yogurts in Philadelphia. We mostly purchase plain yogurt in large containers since we eat it all very quickly... or I make my own yogurts! A big lover of thicker yogurt (that resembles what we call Fromage Blanc in France), I was happy to try the so-called Greek style yogurts when they came out. Unfortunately, Greek yogurt is not cheap; I therefore don't purchase it often. 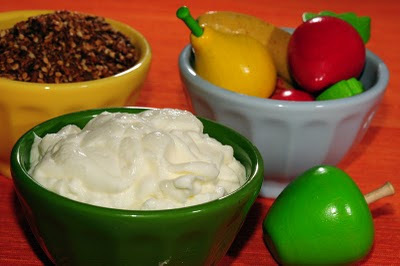 On March 17th, Mark Bittman talked about making your own Greek yogurt at home in his weekly column. I had thought about some before but it took his column for me to experiment. I purchased our regular 2-pound-container of Organic Plain yogurt and a milk/nut bag from the Nature Store next to us. I poured the yogurt in the sack, put the sack in a colander, put the colander over a large bowl and put everything in the fridge for 4 hours. So much water came out in that lapse-time. I was really amazed.... Sure enough, the end-result is thick! And delicious! Very close to Fromage Blanc so we all loved it and ate it all with Muscovado sugar. Un vrai régal! The process is not difficult. The time it takes to make it is fine : you can make it during the week-end and have plenty for the week. However, I was wondering whether it's really worth it. You see, you lose between 50 and 60% of the initial weight depending on how long you let the water drain. 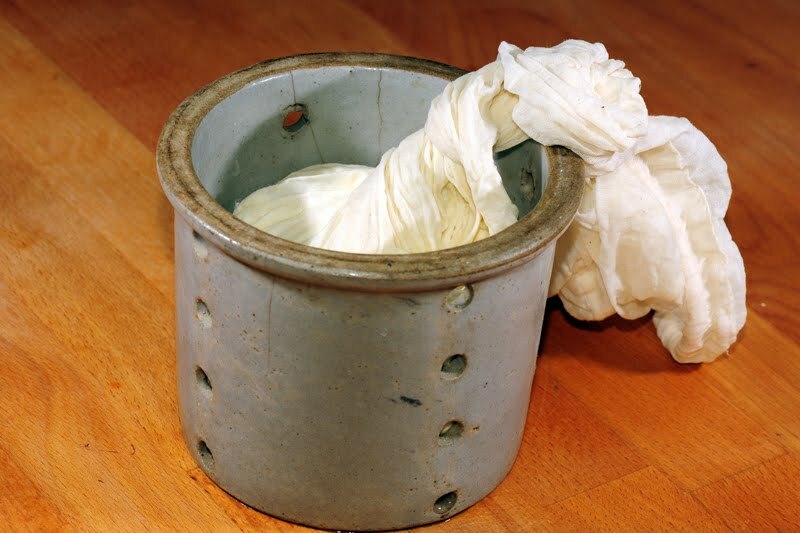 If you purchase a plain Organic yogurt container at $3.50 (for 2 pounds or 907 gr), then, assuming that you only lose 50% of the initial weight, your home-made Greek yogurt ends up costing you $7/lb (but cheaper than the Greek yogurts available around, no?). Then, since you don't have cream added to the end-result yogurt, it still healthier (calorie-speaking) than commercial "Greek yogurt" that use both milk and cream (I know, that's why it tastes so good!). My only advice is for you to find a really good plain yogurt (or low fat) and then try it once. If you like the end-result of your home-made thick Greek-like yogurt, then make some when you have a few minutes to invest in your diet! And keep the commercially available Greek yogurts for special occasions. Bon Appétit! July 4th week-end is coming up, meaning that school is around the corner for us. I don't stress about school: I am actually looking forward to my children going to school even if it means that I'll have to go back to the workforce. After 3 months off, I just realized that I am out of practice when it comes to packing la lunchbox. And this year, I'll have to pack two! As I was going through the list of things I packed last year beyond the obvious home-made sandwich (with homemade baguettes, s'il-vous-plait!) and other leftovers, I remembered that quiches (a.k.a. as tartes salées) were a big hit. As I already wrote, we are big lovers of quiches in our house. I make one at least once a month, sometimes twice if we don't eat pizza. I am always trying to make different quiches (quiche Lorraine, Swiss Chard quiche, Leeks,Ricotta and Bacon, etc.) so that we don't get tired of them. But how could you get tired of tartes salées? Really? It's a nice I-don't-know-what-to-make evening dinner (think a great alternative to pizza), a great dish to bring to a picnic (think July 4th week-end), a perfect brunch option (think having some adults friends over while kids play outside)... but really, as long as it's not too mushy, a perfect lunchbox meal! Since my daughter wanted her quiche sliced, I would pack it in foil/a flat container and pre-cut it so that she would only have to eat it with her fingers fork. If any left, my husband would take his slice for lunch as well. So, it seems that this year, I'll make larger quiches to make my lunchbox-chore easier. In the meantime, we are having quiche tonight because yes, I don't know what else to make and don't feel like cooking much today !! I'll think of something else to put in the lunchboxes on Tuesday! Bon Appétit! In a skillet, saute the spinach in olive oil. Drain on a colander. Lay the spinach on the dough. You can use Feta crumbles if you have some. Use as much Feta as you think you like. 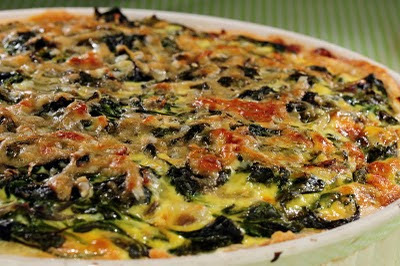 Using Swiss cheese on top will give the quiche an additional crunch.